Hi, there! Welcome to the blog hop! If you came here from Nicole’s blog, you must be a smarty pants;-). If you just stumbled upon this post and would like to start from the beginning, you’d be smart to visit the Pretty Paper, Pretty Ribbons blog. You’re going to love what the design team has put together for the hop! Today we are sharing projects we created with a Smarty Pants theme (nerds, school, etc.) using Pretty Paper, Pretty Ribbons files. 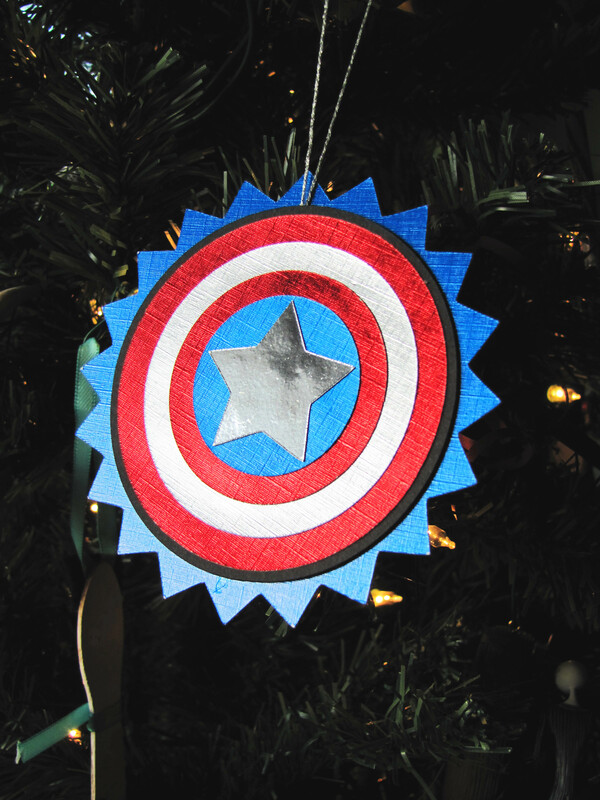 I went nerdy – because we embrace nerdy-ness in our house. 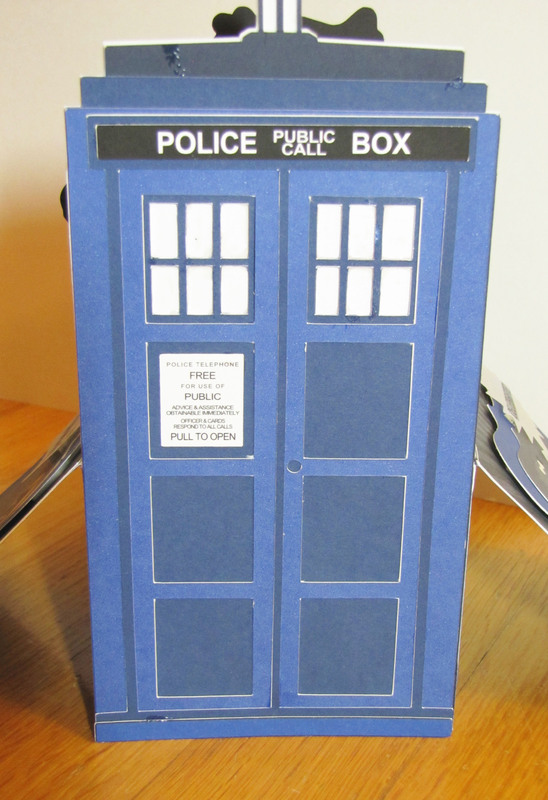 So my daughter is a whovian (someone who watches Dr Who) and she has pretty clear ideas when it comes to which Dr she likes, so for her birthday I make her a 10th doctor TARDIS box card. Thankfully, she was too wiped out from Band Camp to really notice me designing it and cutting it out. I assembled and photographed it when she was out with friends. Anyway, enough rambling, here’s the card, laying flat ready to be made 3D. And everything on this card is from the Pretty Paper, Pretty Ribbons store from the cut files, to the digital stamps, to the fill patterns. It’s really awesome to have all of that to play with! 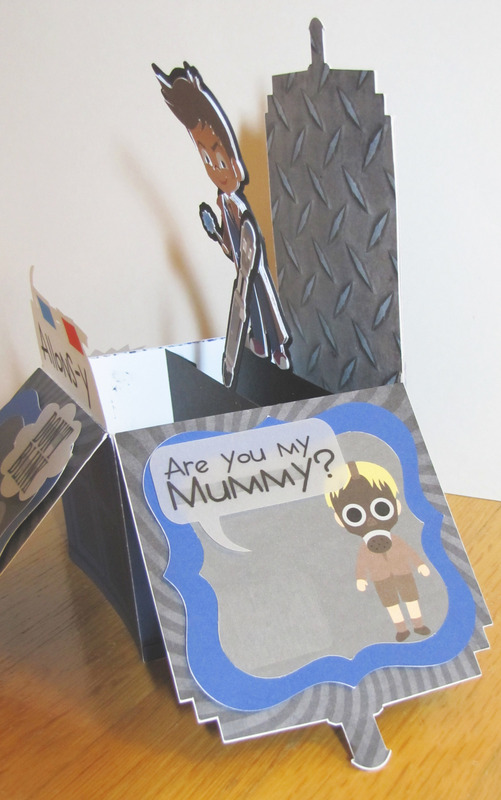 The Allons-y and Don’t Blink are from Lisa’s The Doctor Sentiments Digital Stamps (I use a couple of others, too…) and they are written on shapes from the Speech Bubbles Cutting Files. 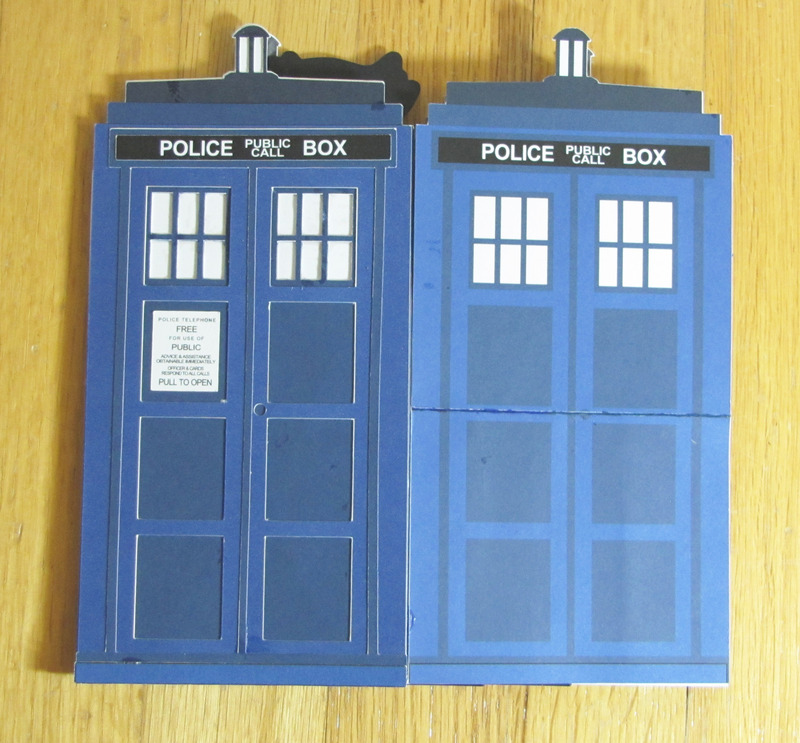 The TARDIS, sonic screwdriver, 3D glasses (gotta have that for a box card, right? ;-) and Dr Who are from The Doctor Cutting Files. The Wheeping Angel is one of the enemies that I used from The Enemies Cutting Files and she is sitting on a label from Layered Labels 1 Cutting Files and the flap is filled with Halloween Bats & Swirls digital paper pattern. The background behind The Doctor is filled with Man, Oh Man Pattern Pack 1 Diamond Plate pattern. Everything is pretty much print and cut which makes for very fast assembly with no guessing about what’s going to match, etc. 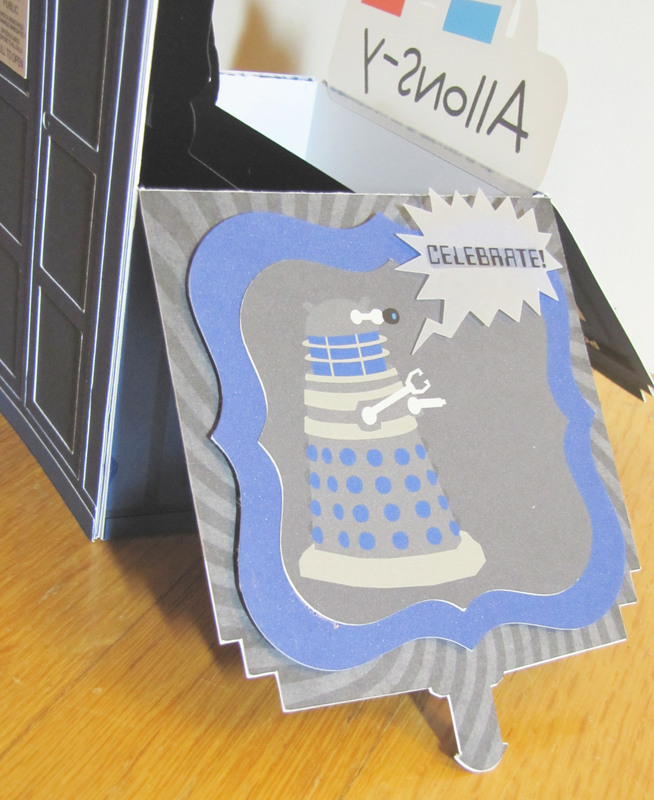 Yep, my head is now filled with a dalek voice saying “celebrate”. Lots of shapes are repeated here, but this speech bubble was a special one that came with the enemies set. Here’s the back (really the door) I printed each layer and had them all cut up then glued them all together. Lots of wonderful detail! Very cool in person and fun to put together! Yup, no new files here, but just loving getting to use these files! Thanks so much for taking a peek at my daughter’s birthday card! I was inspired to create this fun design for her! Are you inspired? Oh, hey! Would you look at what just popped up? The blog candy for this hop is a $15 GC to the PPPR store. For a chance to win, you must be a follower of each blog and leave a comment on each blog. For extra chances, you can also “LIKE” Pretty Paper, Pretty Ribbons on Facebook and/or sign up for the Pretty Paper, Pretty Ribbons Newsletter. A random winner will be chosen for the prize on Tuesday, August 11, 2015. Be sure to pick up the Blog Hop freebie on Saturday and Sunday of the hop, only…then it will be available for sale in the store. 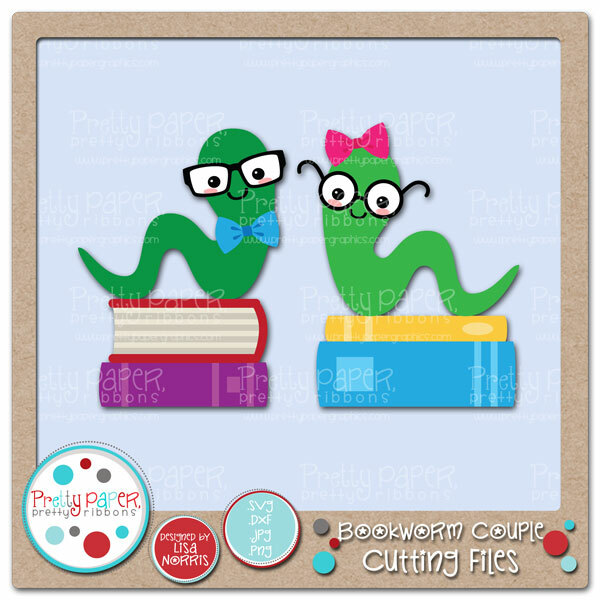 It’s these cuties that Lisa shows off on her blog combined with the Friday Freebie (bookmarks file) which is still available for free in the store. You’d be smart to pick up both of them while they are free! I sure hope you’ll join in our PPPR Smarty Pants Challenge. The projects can be anything that are school or nerdy themed and feature Pretty Paper, Pretty Ribbons files. You can find the rules and the linky tool here: Monthly Challenge. One random participant will win $20 to PPPR. Thanks so much for visiting! To keep on hopping, head to Sarah‘s blog to see her project. 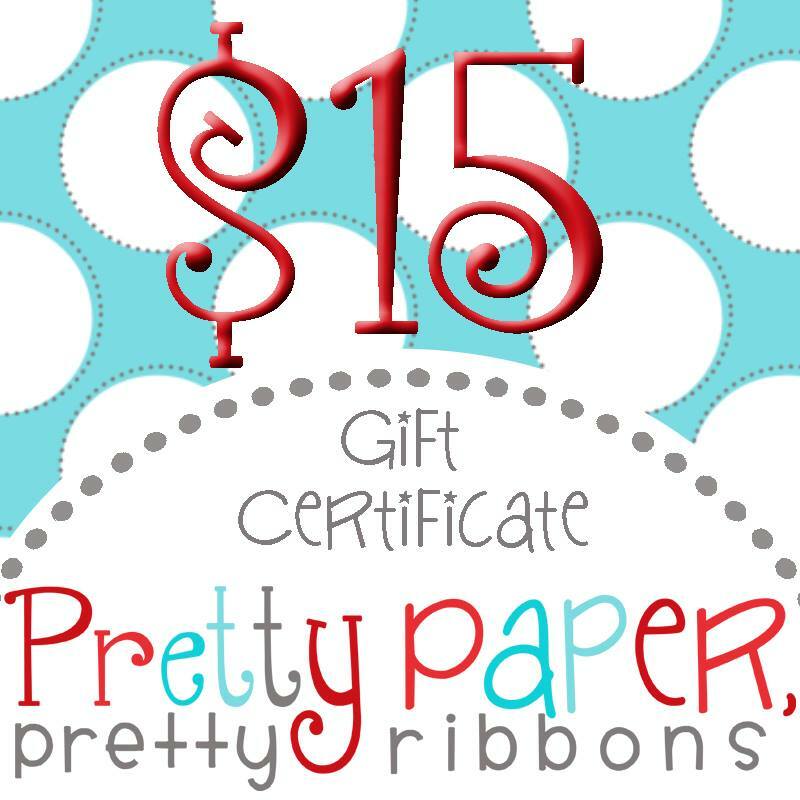 Pretty Paper, Pretty Ribbons, Pretty (Quirky) Decorations! Happy Saturday and welcome to my blog! If you came here from Nicole’s blog, you are in the right place. If you just stumbled upon this post and would like to start from the beginning, please visit the Pretty Paper, Pretty Ribbons blog. Today the Design Team has some wonderful Christmas decorations using Pretty Paper, Pretty Ribbons files. 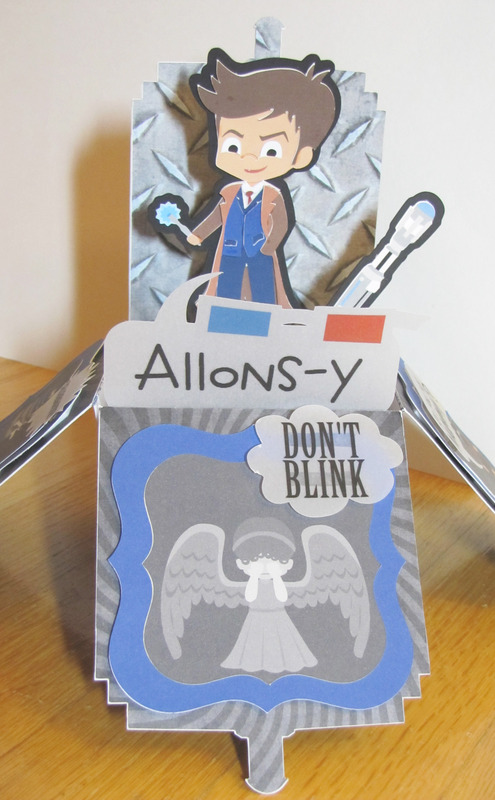 I tend to think outside the (police) box a bit and focus on our family’s interests for my decorations and I find it just delightful that Lisa has designed fun files that work with some of the fandoms my family gets into. First are the Avengers. 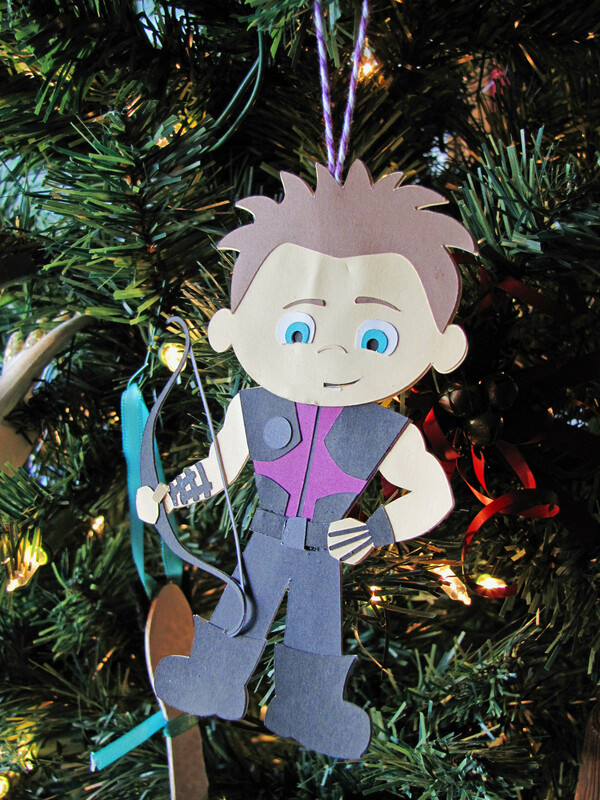 We’ve seen all the movies (except for Hulk) and some numerous times, so I thought it’d be fun to make ornaments for each person’s favorite character. I ended up getting the Superheroes Collection Cutting Files because it has seven different characters which means more fun, right? 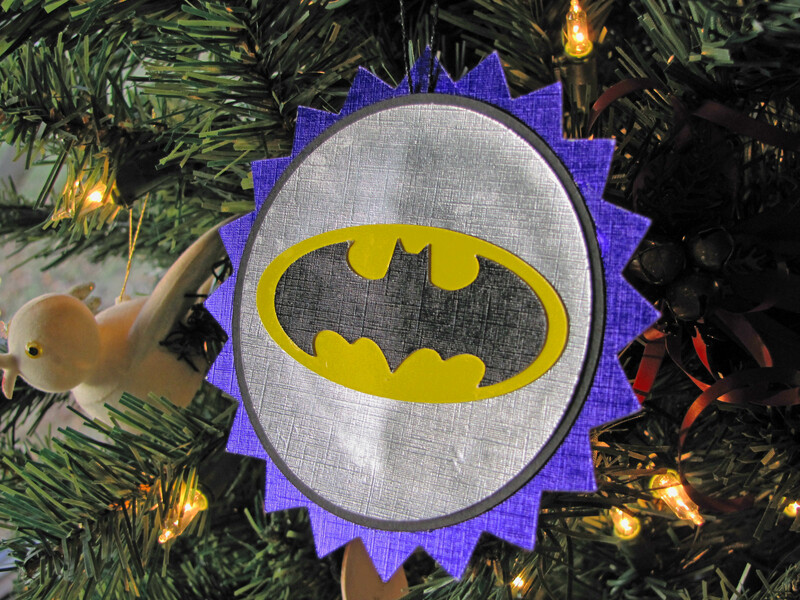 as well as the Batman sign (I know, not Avengers, but he saw the Michael Keaton Batman movie as well as all three of the Christian Bale Batman movies this year – some more than once) because he likes Batman, too. These files were quick and easy to put together (the characters were just a lot of fun adding all the different details.) My plan is to use these for tags on their gifts and then they could be used as ornaments on the tree. 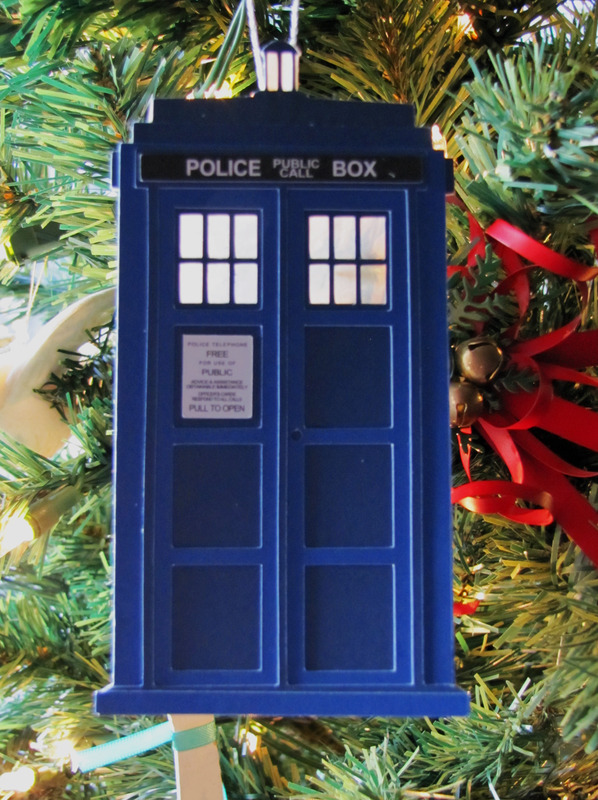 The family ornament I made for this year is for Dr Who (as you may have guessed from my earlier hint about a Police Box.) Lisa has all sorts of Dr Who files (The Doctor Cutting Files – where the TARDIS comes from, The Enemies Cutting Files – imagine a wheeping angel on your tree, as well as The Doctor Digital Clip Art, The Doctor Digital Stamps and also The Doctor Sentiments Digital Stamps). I love how the TARDIS came out! I saved it for last because it got great reactions from the kids (and their friend) as well as my hubby and my friend (who was so kind as to allow me to use her tree for the photos – thank you so much, Lisa Marie Vogt!!!) I used vellum for the windows and light on top so that it could “glow” from lights on the tree. This is the first year that we’ve had access to BBC America so we could watch the show when it’s aired. The whole family would sit down and watch together every Saturday night for the entire season. That’s why I thought the TARDIS would be a great reminder of this year for our family. Lisa Norris reminded me that there will be a Dr Who Christmas special, too, so there’s another Christmas connection! Those are the projects I have to share with you today. 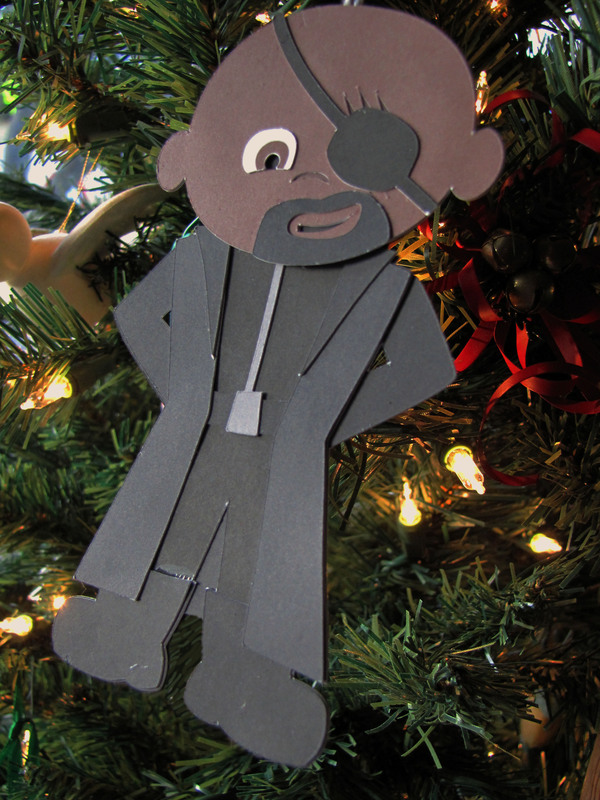 I hope you had fun looking into the ways in which I try to make Christmas fun by creating decorations that have to do with things my family enjoys. The blog candy for this hop is a $15 GC to the PPPR store (Woohoo! That could buy a lot of fun for you and your family!) For a chance to win, you must be a follower of each blog and leave a comment on each blog. For extra chances, you can also “LIKE” Pretty Paper, Pretty Ribbons on Facebook and/or sign up for the Pretty Paper, Pretty Ribbons Newsletter. A random winner will be chosen for the prize on Tuesday, December 16 and announced on the Pretty Paper, Pretty Ribbons blog. Be sure to pick up this super cute Blog Hop freebie on Saturday and Sunday of the hop only available on Lisa’s blog (she is featuring these adorable kids in her project)…after that it will be available for sale in the store. Here is the entire hop order, in case you get lost along the way. You’ll be heading to ****Sarah’s blog**** from here. Happy hopping! Don’t forget to follow and comment in order to be in it to win it for the blog candy. Ruth ~ https://paperandmusings.wordpress.com/ <<<<<——— You are here! Sarah ~ http://sarahvaitstamps.blogspot.com/ <<<<<——— Head here for Sarah’s awesome project!